I’m sure many of you will have already seen, due to the slight changes on James’ shirts. We are delighted to announce that we have teamed up with WeWantAnyCar. The great news is that both James and Sammi will be brand ambassadors for WeWantAnyCar for 2017, and we hope long into the future. This news is an excellent way to start 2017 for Team Wade, and both James and Sammi would like to thank Nigel Fletcher, Managing Director of WeWantAnyCar for the opportunity to be brand ambassadors. 2017 looks set to be a fantastic year, and our partnership with WeWantAnyCar is exciting times for everyone. Across the year we have some very special things planned with Nigel and the team, we think all the Team Wade fans will love some of the opportunities coming in 2017. 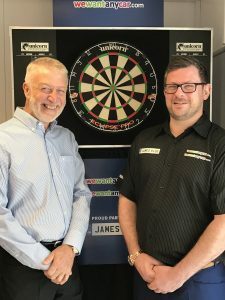 You will have the chance to meet and greet James and Sammi, along with the opportunities to watch James play in some of the biggest arenas in darts.